In fond memory of Maggie Richardson, 1901 - 1974, who sold flowers here for 60 years. This is an excellent example of how even modern plaques can be very pretty. The flower seller on our visit very kindly adjusted the awning over his stall so that we could take this picture, and told us that his grandfather, also a street vendor, had known Maggie and had been instrumental in the erection of this plaque. He and his family take responsibility for maintaining the plaque. 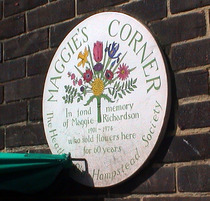 Sold flowers at "Maggie's Corner" for 60 years.